Almost every power tool manufacturer has a biscuit jointer in its stable, and Freud, which are more known for their line of router bits and saw blades than for power tools, are no exception. This JS102 is their top model and the difference between it and their JS100 model is the tilting fence. 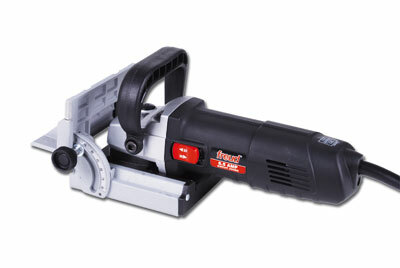 The all-metal construction - apart from the motor housing - makes this a solid tool that is a pleasure to use. The plunge action is smooth, and the depth of cut is easily set by the thumbwheel on the side; this has settings for all standard-sized biscuits. The good-quality blade makes precise cuts for biscuits, or any other fittings such as hinges and other joining devices designed for biscuit slots. The sliding angle plate to position the cut on the workpiece is easily set, either by eye or by using the scale. It is locked by a small lever which holds the plate firmly in place. 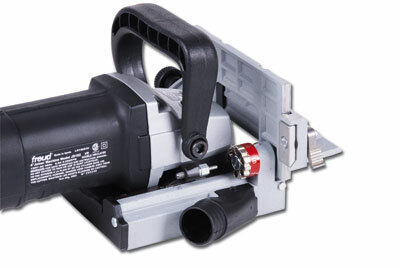 The on/off switch is well positioned for the thumb, and when switched on, the motor runs quietly, even under load. The tilting fence can be set at any angle between 0 and 90 degrees, and there are indents at 0, 45 and 90 degrees to make those popular angles for edge mitres easy to set quickly. My only criticism of the tool is the top handle, which is made from plastic, feels a little flimsy and has sharp edges - these will no doubt wear off with use. 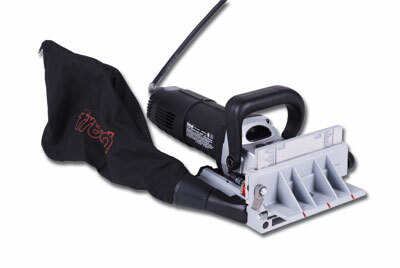 A dust spout on the base can either be attached to your vac, or the supplied dust bag can be plugged into it. The tool has a long cable and comes with oil for lubricating the slide, wrenches for removing the blade and adjusting the depth stop, a wire gadget for removing the springs for maintenance, and finally some biscuits to get you going. It is all tidily contained in a blow-moulded case. Setting up this jointer for a variety of joint settings, both on the edge or face of a board, is a breeze, and the design of the tool makes cutting biscuit slots a fast and accurate process. "The design of the tool makes cutting biscuit slots a fast and accurate process"